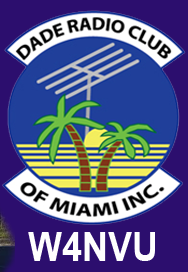 November 2014 – W4NVU – Dade Radio Club of Miami Inc.
Meeting was called to order at 19:34 with 30 present. We have a quorum. Julio presided over the meeting and welcomed everyone. The meeting was not broadcast live on the air tonight from the EOC. There was testing being conducted in another room tonight. Julio asked all veterans to stand and thanked them for their service. Julio then led us in the Pledge of Allegiance. Everyone took turns and stated their name and call sign. Julio welcomed everyone again and that we do not have a guest speaker tonight. Julio reminded everyone present tonight to sign in. A motion was made by Miguel to accept last month’s minutes as posted, seconded by Hollis. The minutes were accepted as posted. Corresponding Secretary: Lloyd had no mail. Nothing new. Treasurer – Brianna advised that she is collecting dues for 2015 and the Holiday Party. Please see Brianna to pay your dues. The dues are $35.00 per person and $5.00 each family member. They must live in the same household. We have received $350.00 so far in 2015 dues; $275.00 for the Holiday Party and $235 for Ham Night Out. Website – Julio advised that it has been updated. Club Elmer/PIO – Miguel advised that everything is good. Look at the club website for any information. Newsletter – Julio advised that if you have anything to get it to him. We are looking for writers. The Reflector is posed on the website as well as past issues. Miguel announced that last Wednesday he met Dan. He is a teacher and has a conflict the same night that we meet. Miguel will contact him to see if he can help with the newsletter. Miguel spoke about the Hambulance. Progress has slowed down. There is a battery issue. The body has been restored by Robert Morgan. Ben Nemser donated connectors and cables. HF rig was donated by a silent key. We are looking for wire antennas. We have 2 Orion’s and are looking for a dual bank programmable radio. Miguel spoke about “Ham Night Out”. Everyone had a great time and he explained what they did. The DRC Holiday party for 2014 – Miguel advised that it will be at the Elks Lodge on Dec 8 for our regular meeting. It will be a dinning room buffet. They are at 10301 SW 72nd Street in Miami. Dinner is “Italian Night” and the cost is $25.00 per person. Pay today or pay online as we need a head count a.s.a.p. Ben Nemser spoke about the Miami Marathon. He thanked everyone that helped out before. It will take place Sunday morning January 25, 2015. There are over 2,000 runners. They will be showcasing Miami. He needs operators and this will promote Ham radio around the world. You will get a free tee shirt. Let him know if you can help out. There are 30 spots open. It will be the same route. He has the support of all county agencies. Any questions or if you can help, please see Ben. Julio announced that when you pay your membership dues you will get a bumper sticker and a lanyard. We are also working on ID’s for the club. Hamfest – 2015 Tropical Hamboree. Lloyd said it is coming along well. He went to the Miami Maker Fair last Sunday and made great contacts. We have a special event call sign – W4B. We will have a live HF station there. There will be QSL cards for anyone that works a station. Lloyd spoke about W5YI. We are now authorized and W5YI certified to give testing. W5YI can issue a call sign right away. Testing that is done at the Hamfest, those that pass will be able to get their call sign right away. We need volunteers and the next meeting is November 25. Junior Orange Bowl Parade- Lloyd updated us for Brandon who is out of town tonight. It is taking place on Sunday November 30. He needs volunteers. Please see Lloyd. Ryan spoke with Professor Houseben at Miami Dade College who asked someone to provide to his class on Monday or Wednesday nights a 5-10 minute presentation on Radio Communications. Testing will be done for the same class. Anyone can assist. W4NT is the call sign. Lloyd volunteered. The 147.000 – Miguel advised that the audio sounds good and we can use it now. The 147.760 – Ray is out tonight. Miguel advised its working and the audio is low. The 224.200 – Julio advised that the new site will be at Miami High and hopes to get permission during the Christmas break to get it up and working. The 444.200 – Carl said its working. Ask the people that are using it. The Digipeater – 144.390 – Merritt advised that he is working on a project. D-Star – Miguel advised parts are needed. 145.610. Emergency Committee – Lloyd spoke about the SET on October 18. It was a success. We get 206 points from ARRL. He thanked everyone that participated. If you were one of the communicators, you will receive a certificate of appreciation at the Holiday Party. Net Manager – Brandon was not here tonight and Lloyd advised that we need more operators. Testing – Dave advised that we have 2 new techs, 3 generals and 1 extra tonight. It was a good session and congratulations to everyone!!! Julio announced that for our January or February meeting we will have the former Races Officer for New Orleans Parrish during Hurricane Katrina via Skype. He will discuss how things were handled by Amateur Radio. Miguel – Emergency Committee Chair – announced that there will be no December Ares/Races meeting. The next meeting will be in February after the Hamboree. He reminded us that just because we are coming out of hurricane season and we got a break this year, we need to work on our go kits. In February we will have a demonstration on go kits. The application for Ares/Races membership is on the website. Any questions, please see Miguel. Miguel announced that there will be the Flamingo Free Flea at UM Engineering parking lot this Saturday November 15 at 7 AM. He also announced that on November 29 that Hamfest in the Woods will take place in Okeechobee. Julio asked if there was any other old business. There was none. Julio asked if there was any new business. There was none. Julio thanked everyone for coming. Merritt made a motion to adjourn, seconded by Virgil. The DRC meeting was adjourned at 20:14.